Even when I'm on vacation, selling crafts is often on my mind. My family and I were lucky to enjoy a road trip to Quebec and Canada's Maritime provinces, and, happily, this part of Canada is a handmade lover's haven. Of course, I didn't share this fact with my kids when I was planning the trip. The only kind of craft they are interested in is Minecraft, so they didn't need to know about all of the delightful artisans' shops I was planning to visit. Nevertheless, I did manage to work in a lot of visits to some gorgeous artisans' studios and shops during our visit, and while I was there, I was mentally making notes about all of the smart things artisans were doing to promote their businesses to tourists. Here's what I learned about selling crafts to tourists, from a tourist's perspective. Selling to tourists can begin before your customers have even left their home. If you want to make tourism dollars a substantial part of your business income, look for ways to get your business promoted wherever tourists plan their vacations. 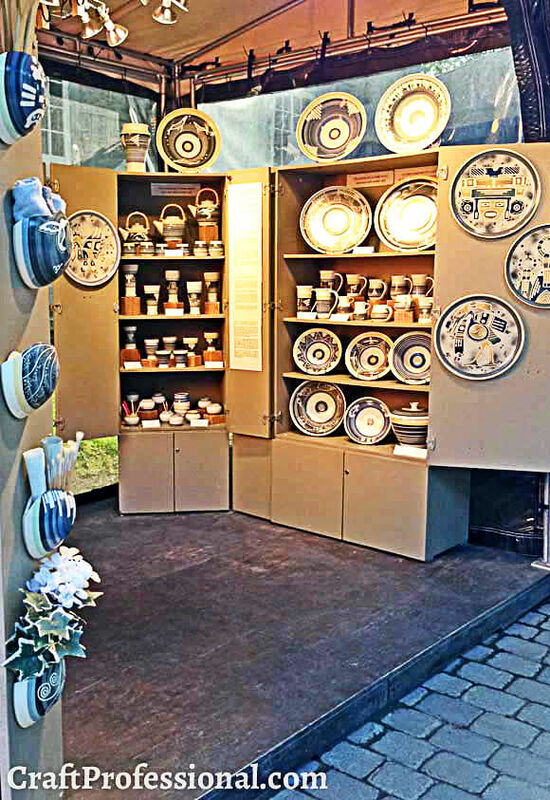 Handmade pottery displayed in one of several semi-permanent, kiosk-type booths found along the cobble-stoned streets in old Quebec City. Do a search for your local area plus the word travel, and see what sites come up. You'll probably find a mixture of official government or Chamber of Commerce-type sites, as well as some privately owned websites. Contact the administrators of these sites to find out how your business can be featured on their site. Often, business associations like the Chamber of Commerce will include your business on their site when you become a member of their organization. A proprietor of a privately owned website related to your local area is probably always looking for good content to feature about the area and might like to do an interview with you to create an article about your business. He or she may also accept paid advertising, which could be helpful if the site gets enough visitors to make the price worthwhile. Some privately owned tourism sites will also make referrals for a finder's fee. That is, they will send you customers for a fee. This arrangement can be worthwhile if you sell a higher priced product or service and you have a way to verify the customer came to you as result of finding you on that website. For example, imagine you teach a class marketed to tourists in which they make their own piece of authentic local jewelry. If there's enough profit built into the price of the class, you could pay a referral fee for any customers who take the class and were referred by the website. Compared to straight advertising on a site, this arrangement takes a little more work to manage, but the advantage is that you only pay when the website sends you customers. How do you know if a website gets enough visitors to be able to send you business? If the site appears in the first few results of a search for your location plus the word tourism, that's a good clue that they probably get enough traffic to send some customers your way. If you want to really research potential partners in depth, I've written about how to develop better online business collaborations here. Make sure you have promotional materials available at your local tourist information centers. Be sure your marketing materials are professional looking. They will need to make a good impression alongside all of the other local businesses that are promoted to tourists. Check with your local tourist board for partnership opportunities. You are both working toward a similar end; to encourage tourists to visit and spend money in your community, so there might be some great opportunities to work together. Ask if your tourist board offers any guidance on how to promote to tourists. See if they offer any marketing opportunities you might want to take advantage of. 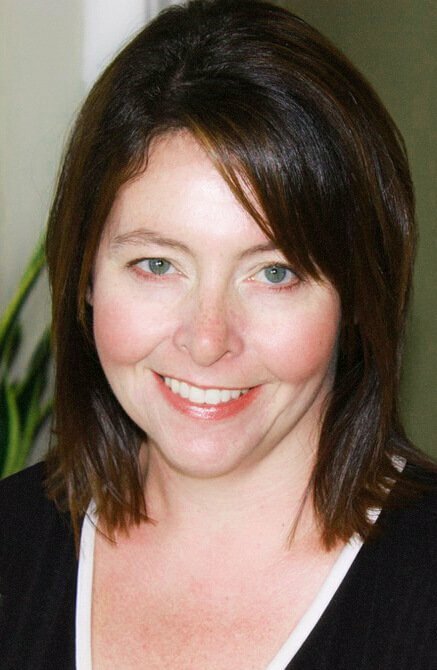 I worked one summer for our local Chamber of Commerce, and from that experience, I can tell you it is much easier to promote a business that you know about personally. Take advantage of opportunities to educate tourism professionals about your business. Drop into their offices and introduce yourself. If it is possible to invite staff to your shop, do so. If there are trade shows or marketing events that local tourism professionals will attend, consider participating yourself, and be sure to connect with those people while you are at the event. Be sure tourist center staff are made aware of special events or promotions that might be of interest to visitors. Find out how your tourism professionals are kept up to date on local businesses and participate in those updates. When I worked for our Chamber of Commerce, I was required to promote all Chamber of Commerce members equally. So, for example, if a tourist asked about local flower stores, I had to make sure I mentioned all of the flower shops whose owners were Chamber of Commerce members. I was allowed to mention businesses that were not Chamber of Commerce members, but I had a list of all member businesses, and I had to ensure tourists knew about all of them whenever they asked for a certain type of business. The lesson here is, you need to join your local Chamber of Commerce if you want them to be invested in promoting your business. 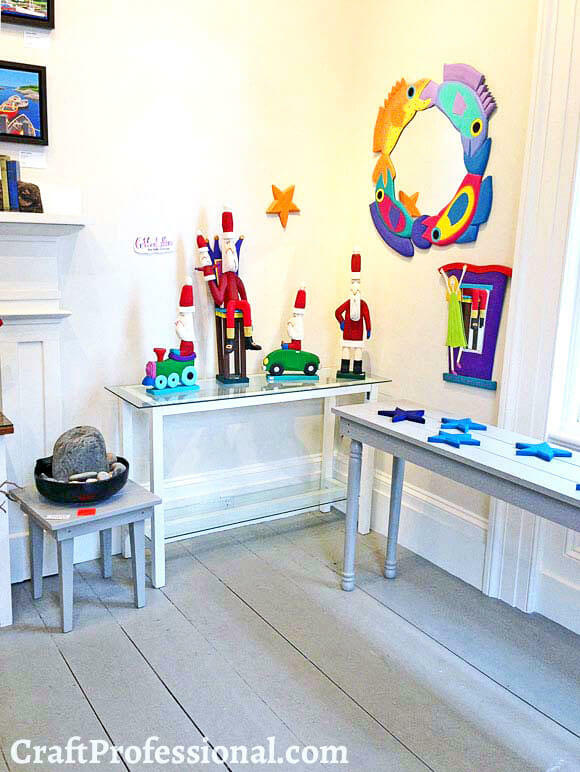 Some lovely handmade items on display in this shop in Lunenburg Nova Scotia. 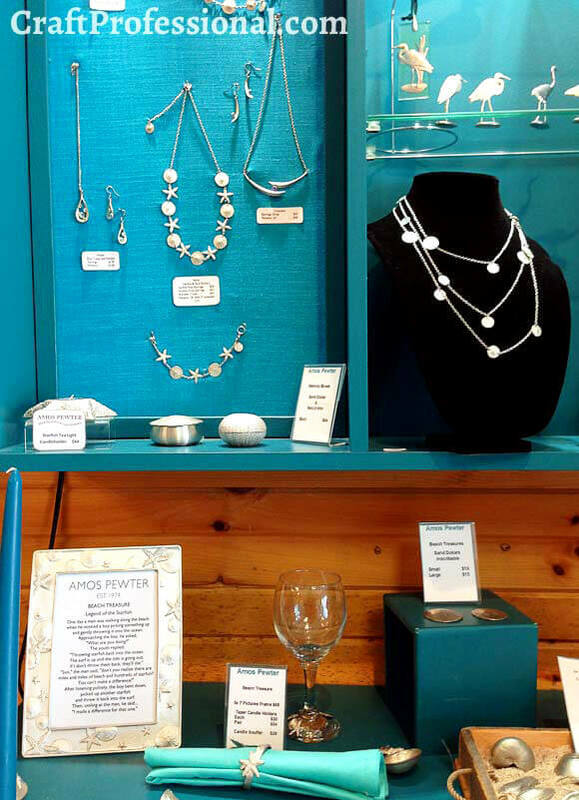 The main street has several gorgeous stores selling local, handmade products. There are almost certainly specific areas in your city that are more tourist-friendly than others. If you're lucky, your area might already celebrate its talented artisans. Look for ways to connect with that resource. If opening your own shop in a tourist-commerce area isn't feasible, look at having your items sold (either on a wholesale or consignment basis) in an existing shop. Connect with local, non-competing businesses that cater to tourists. Perhaps your product fits well with a local hotel, restaurant or attraction. For example, you might offer a 10% discount on your product to people who are staying at a certain hotel. There are often ways that non-competing independent businesses who cater to similar customers can develop win-win relationships. Handmade pewter mementos have nautical designs. A perfect souvenir from an ocean-side vacation spot. Is your area known for a traditional craft? Is there a way to connect your craft to the area through design, techniques, or materials? Can you demonstrate your craft and make it more of an experience? Are there connections to your local history that you can plug into? What is your area known for? Why do people visit your area? How can you work that into your products? Finally, consider what kinds of mementos people would typically buy in your area. The answer will vary depending on your location. A visitor to a chic city will buy something different than a visitor to an area known for casual beach resorts. Remember to think about what types of souvenirs tourists will bring home. Do they generally fly to your destination, and therefore, are limited to small items they can fit in a suitcase. Is your area more of a road-trip destination, so visitors might be able to bring home a slightly larger purchase? 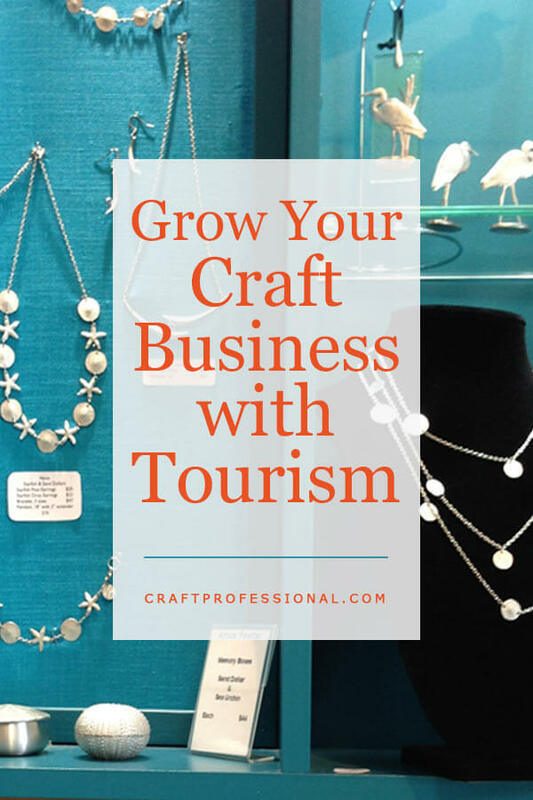 If you're fortunate enough to live in a location with a strong tourist-based economy, and if you're doubly fortunate to live in a place that celebrates its artisan community, attracting tourism dollars can be an important part of your business plan. 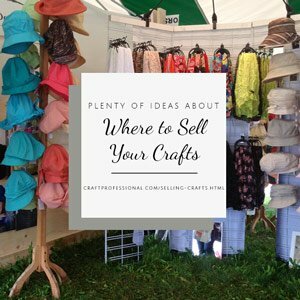 Oodles of places to sell your crafts. 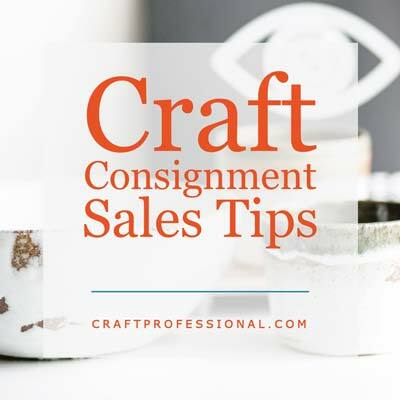 How to negotiate consignment arrangements with shop owners. 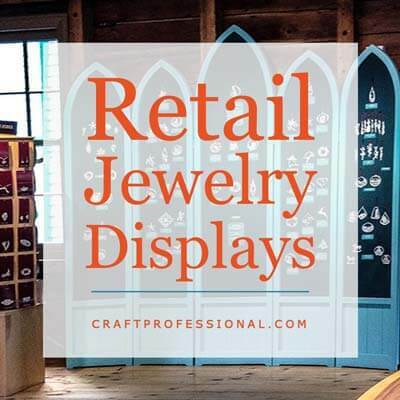 See how this handmade jewelry shop uses clever branding to sell to tourists.